*Click here for an extensive list of books, chapters and original articles authored by Dr. Gulani for Lasik surgeons worldwide. 1. For Eye Surgeons to strive for vision beyond 20/20 in their patients. 2. For patients to research your Surgeon and SEE clearly thru the advertising maze. “See Clear in Jax” has a new meaning. Having turned Jacksonville (Jax) into a Vision Destination for the world, Dr. Gulani continues to raise the bar in eye surgery both in patient care and surgeon training. The real basis of customized surgery is in selecting the best surgery for each individual eye and then tailoring the technique for a customized vision outcome. The limitation to this is that in most cases, Lasik surgeons know of only one or two techniques and hence the patient is not given much choice for their best surgery. Dr. Gulani teaches Lasik surgeons the entire spectrum of vision surgery and reiterates to them to approach each eye like a camera and fix it’s optical elements for the best vision potential that patient may have. Everyday people are turned away from Lasik eye surgery; be it they have too thinner corneas, cataracts, large pupils…the list is endless. This means every day people give up hope that they can receive the vision that they want without the aid of glasses. However, Dr Gulani, as defined by Goldline Research as one of the United States leading laser eye surgeons, offers the possibility that all is not lost. Undoubtedly, LASIK eye surgery is one of the leading forms of eye surgery for those seeking sight without glasses and contact lenses. However, there are many criteria one must fit into before being eligible for this type of surgery. What Dr Gulani tries to emphasize is that there are nearly forty more surgeries and combinations available and the likelihood is that at least one of them will be suitable for your eyes. Nearly everyday we hear of a new advance in medicine that could revolutionize our eye care; last week we heard of the bionic eye, this week the light-adjustable lens. And all of this news provides hope to hundreds of people who suffer from various different eye diseases and injuries. Dr. Gulani stresses that people should not give up hope at the first sign of rejection from eye surgery; if you have a thin cornea; you could instead get a contact lens placed permanently into your eye (Visian ICL). Equally, Dr. Gulani himself performed a miraculous surgery back in 2003 where he successfully restored an 75-year-old woman’s visual impairment with an artificial corneal transplant. Gulani added himself to the revolutionary list of surgeons as he used a cornea out of a polymer flown in from Australia. He described this surgery as “the future of eye surgery”. With there being nearly forty different surgeries and combinations available, perseverance is the key in finding the right one for you. It is just a case of speaking to your optician, doctor and other eye care specialists over what surgery would be suited to you and your eyes. This will raise the bar on safety and predictability in truly customizing your VISION. LASIK eye surgery involves the use of the very precise (cuts 1/4th of a micron at every pulse) Excimer Laser which re-shapes the cornea (clear front window) of the eye according to the glasses prescription of the patient. The surgery is done in minutes, with the patient awake, active and participating; only numbing drops are used in the patient’s eyes. This method provides the quickest healing and fastest results. Visual recovery is extremely fast most patients gain driving recovery by the day after surgery. Unfortunately, these are the very reasons that this surgery has a tendency to become a commodity in many places enough to mislead the patients. Arun C. Gulani emphasizes that Lasik is just one among 16 Laser Vision Surgeries which themselves are among 40 different Vision Corrective Surgeries (surgeries to remove glasses and contact lenses). Dr. Gulani has invented Lasik surgical instruments, published Lasik protocols and teaches LASIK complication management to eye surgeons all over the world. He has recently introduced a new super-specialty in Lasik called Laser Corneoplastique™ by which many of the Lasik complications can be corrected back to excellent vision. Nevertheless he says, Prevention is the way to go! • Doctors who may be new and inexperienced themselves but use the established name recognition of their more experienced, senior partners (who may have actually even retired from the practice). • Eye surgery “Mills” that advertise the joint number of cases done by all chain centers across the nation (ie. 500,000 cases done) while their surgeon may be a novice with a high chance of causing bad outcomes. • Doctors using celebrity testimonials (NFL sportsmen/movie stars etc). In many such cases, the doctors actually pay a hefty sum to be known as official surgeons of such celebrities. Also, they most often will do surgery for free to get an endorsement. • Patients are not educated about other available options since the surgeon may themselves not be capable of performing those options. • Patients feel intimidated to ask questions about surgeon qualifications, vision expectations, side effects etc. Poor pre-operative Technological analysis of the patient’s eye anatomy, vision and stability. • Lack of understanding on surgeon’s part regarding interaction between, anatomy, physiology and optics of the eye to get a great vision outcome. • Inability to deliver the best outcomes due to lack of modern, cutting edge equipment. 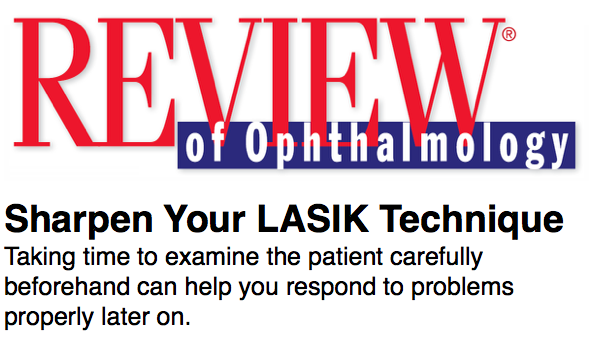 • If your surgeon says that they are the First or that they teach other Lasik surgeons, ask for evidence. Are they first in the world, country, state or just on their street (decreasing order of importance). Do they teach at local dinner meetings that they host or are they invited to teach nationally at prestigious podiums. • Meet with the surgeon, get a feel for the integrity and involvement of the surgeon in educating you and answering every question. Also make sure that your surgeon is contactable and that they do indeed respond when you call. • Make sure that your surgeon will see you before surgery, perform your surgery and also see you and be available after your surgery. • Find out if your surgeon performs the full spectrum of Laser Vision Surgery (remember Lasik is just one of many Laser Vision techniques) so they can offer what is truly best for you rather than suggesting the only surgery they know how to perform. • Do not fall for flashy computer screens and equipment in the office; make sure that you understand all that is going on and insist on asking the surgeon to explain in layman terms. • When meeting your surgeon, do ask about possible side-effects and complications. Ask if in the rare event that you do end up having a complication can they handle it? If the answer is yes, then ask for evidence. Thus due diligence on part of the patient, experienced selection of individualized surgery by the surgeon and effective use of modern technology can all together raise the bar on safety and predictability in LASIK -- one of the most successful surgical breakthroughs of modern times.